The event took place on Wednesday, March 23, at the institutionâs premises at Carapan, under the theme: âPreserve Water: Preserve Lifeâ. The members of the group have accomplished several things since the programme got going. Among the achievements are the establishment of an irrigation system on the schoolâs compound, using water from the washrooms to water plants; site visits to water catchments; a visit to a hydro-electric plant; visits to primary schools; distribution of water to members of the public; and the installation of a water fountain. Marissa Bennett, President of the Young Leaders, spoke of the importance of conserving water. She said people can save the lives of others by practising this activity. Sessions were conducted at the fair by the Central Water and Sewerage Department (CWSA), St.Vincent Electricity Services Ltd (VINLEC), the Forestry Division, the Fisheries Division, and the Public Health Department. Representatives from these institutions were asked to discuss the importance of water in providing services to the state by their institutions. Bennett said her group is making an extra effort to inform the public about the importance of water and measures that they can take in doing so. She used the opportunity to challenge students in forms one to three to be Young Leaders when their turn comes around, so that they can impact on the lives of others. Bennett said the Young Leaders are in the process of planning a Water Day, where students will bring as much water as they can to the school. The water will then be distributed to members of the public. âThis yearâs programme has benefitted me because I get to learn a lot from other students. It has also helped me to develop myself in many ways,â said Bennett. 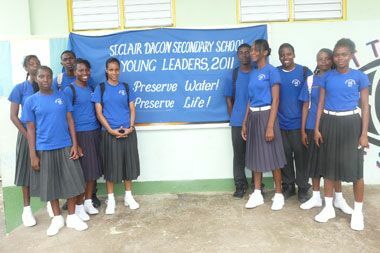 The St. Clair Dacon Secondary School Young Leaders is composed of 27 fourth formers.